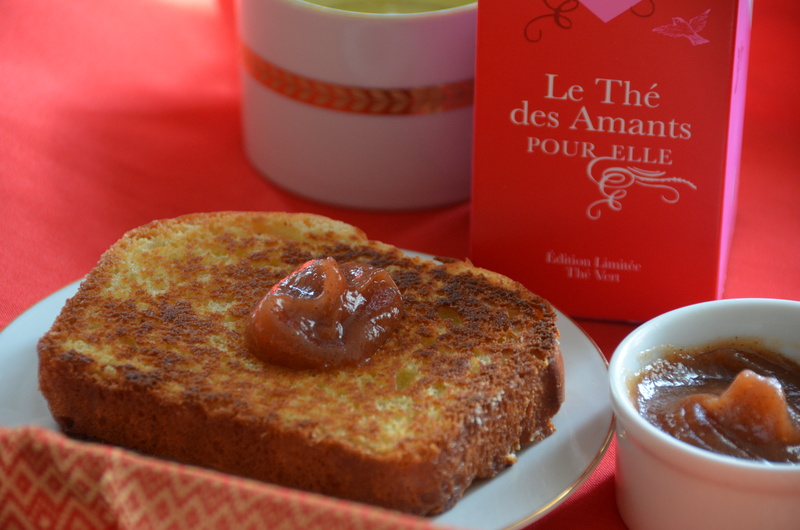 Le Palais des Thés has come out with a limited edition tea for her and him this Valentines Day. I was lucky enough to get my hands on the Thé des Amants for her. It’s a spicy green tea with citrus and fruity notes and it smells amazing! I couldn’t decide what to make to go along with it, but I finally settled on brioche and pear butter. I just love this! It’s perfect for breakfast or a quick snack. Add yeast and warm water to the bowl of your stand mixer. Let sit about 5 minutes until mixture starts to foam. Add the 4 eggs, sugar, and whisk until combined. Place dough hook on mixer and add flour and salt to mixture. Turn mixer to low and knead for about 5 minutes until smooth. Add butter, and increase speed to medium. Continue to knead for an additional 5-10 minutes until the butter is fully incorporated. Place dough in a medium bowl that has been buttered and cover with plastic wrap. Refrigerate over night. Flour your work surface and remove dough from bowl. Shape dough into a loaf and place in a buttered loaf pan. Cover with a kitchen towel and let rise about 2 hours. Brush loaf with beaten egg and bake for 30-40 minutes in a 375 degree oven until a toothpick comes out clean. If the top of your loaf is browning too quickly, place a piece of foil over it. Let brioche cool in pan for a few minutes, then turn out on a rack to finish cooling. Place pears, lemon juice, and Riesling in a medium pot. Cover with lid and cook about 20-30 minutes until tender. Remove from heat and place in blender and puree until smooth. Return to pot and add sugar, vanilla bean. and spices. Cover and simmer until pears have reach the desired consistency. I wanted mine to be on the thick side so I ended up cooking the pears about 4 hours covered and an additional hour uncovered. make sure you stir the pears frequently so they do not burn. Remove vanilla bean and place pear butter in sterilized jars. *If you do not like things very sweet I would reduce the sugar by half.